Rachel Fendell Satinsky | Littler Mendelson P.C. Rachel Fendell Satinsky dedicates her practice to employment litigation and counseling. She advises clients on an array of issues including hiring and terminations, leaves of absence, accommodations, harassment, and other matters related to federal and state discrimination and civil rights laws. Rachel partners with clients to draft policies, procedures, and processes that are tailored to clients’ business needs and workforce. She regularly advises and represents companies in matters involving the enforcement of restrictive covenants, including covenants not to compete and not to solicit, and the protection of trade secrets. She also has extensive experience drafting restrictive covenants. 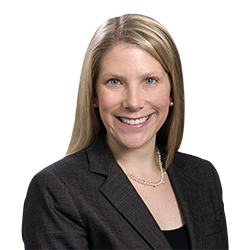 Rachel’s practice also includes defending clients against claims arising under Title VII of the Civil Rights Act, the Family Medical Leave Act, the Age Discrimination in Employment Act, the Americans with Disabilities Act, the Fair Labor Standards Act, and similar state and local laws. She also frequently appears on behalf of clients before federal and state administrative agencies and guides clients through the administrative process. Since 2011, Rachel has served as a volunteer attorney for the Pennsylvania Innocence Project. During law school, Rachel participated in the University of Pennsylvania’s Supreme Court Clinic where she helped represent clients in matters before the United States Supreme Court. She was a senior editor of the Journal of Business Law and the spring chair of the Moot Court Board.